This page contains a translation into English of the lyrics to the popular Greek song "Oi Manges den Yparhoun Pia" (Οι μάγκες δεν υπάρχουν πια), which was sung by Nikos Papazoglou. Also included is a pronunciation guide for the Greek lyrics so you can sing along if you like. ABOUT THE PHOTO: This photo shows a group of manges. This song refers to the mangas, a slang word for people who were part of an urban counterculture movement in Greece in the late 19th and early 20th centuries. The word "mangas" in Greek is not spelled with the letter “n”. However, many old rebetes who use this word in their musical lyrics do pronounce an “n” sound, even though it does not appear in the Greek spelling. An equivalent term in English might be "real men" or "manly men" or "macho men". Some refer to the mangas as fictional characters, but they were actually very real. Not everyone can be a manga. There were bad ones thought of as bullies, and respectable ones thought of as brave or crafty. The term can at times be used as a compliment. Women may also be referred to as mangisa or mangiora. 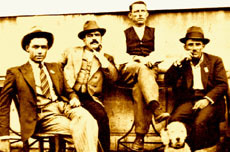 A number of rebetiko songs featured mangas as characters in the titles and lyrics. Mangas are closely associated with the history of rebetiko music, though they existed before. The term arose at the time of the 1821 Greek revolution. The soldiers were separated into groups, and one of the groups was given this name. For some, the term represents survival skills. At the time, the word mangas carries a positive, respectful meaning. Mangas tended to belong to the working class, and walked with a swagger. They often wore a jacket, a tight belt, a felt hat, striped pants, and pointy-toed dress shoes. They smoked cigarettes, often had moustaches, and enjoyed a reputation of being popular with the ladies. Today, the slang word manga still exists to describe men whose behavior fits the stereotype. Although it often now carries negative connotations, there are still situations in which it has positive qualities. For example, in my work I encounter many men who try to test their boundaries, and at that point it may no longer be possible to converse politely. The Mangisa in me comes out and I put them in their place. A nightclub dancer can use her inner Mangisa to speak their language, displaying attitude. In this context, it is for self defense and self respect to make them understand she is not naïve, nor can she be played like a deck of cards. All dancers should have an inner Mangisa. It's a form of street smarts. 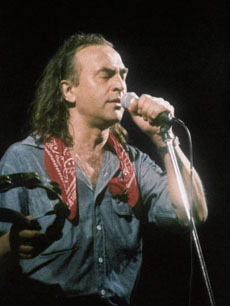 Born in Thessaloniki, Nikos Papazoglou was a popular singer, songwriter, and music producer. He began performing at the local level in the 1960's. In the mid-1970's, he met Manolis Rasoulis when they worked together on a project to create a musical based on a play by Aristophanes. Following this, they teamed up in 1978 with Dionysis Savvopoulos and Nikos Xydakis to create a groundbreaking music album that achieved critical acclaim. Some credit this work with changing the course and perception of Greek popular music. Building on this success, Papazoglou and Rasoulis collaborated again the following year to create another commercially successful work, Ta Dithen. 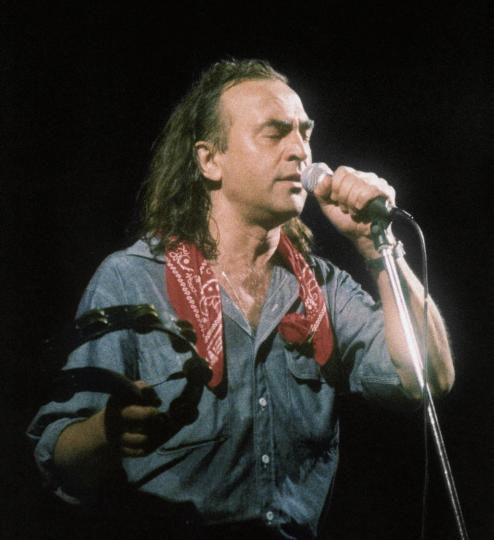 ABOUT THE PHOTO: The singer in the photo is Nikos Papazoglou. Οι μάγκες δεν υπάρχουν πια Ee manges den yparhoun pia Real men don't exist any more. με ναργιλέ σβησμένο me argile svismeno with the hookah extinguished. ο Χάρος και πουλιότανε o Haros ke pouliotane he (5) was selling himself. του αγοράζει δυο κιλά tou agorazi dio kila she bought two kilos from him. The baglama is a musical instrument from Anatolia (the land mass known as modern-day Turkey). The hold is the lower part of a boat, below the deck. The prow is the front part of a boat. The Greek word "laiki" refers to an outdoor farmer's market where people can buy fruits and vegetables. Vendors may also offer other items such as blankets, clothes, etc. However, usually an outdoor market with tablesand stands that sells these household items would be known as the "Roso Pondi" (Russian Pondian). It refers to the people who relocated to Russia from the Pondian Black Sea regions of Asia Minor. Not all districts have these markets, but most do. Often, Greek Romany people will be among the vendors, perhaps driving around in their trucks with megaphones promoting their fruits, vegetables, household goods, etc. Although people do shop at regular grocery stores, they also will go to these farmer's markets which are held once a week in each city/town throughout Greece. In ancient Greek mythology, Charon was the son of Erebus (darkness) and Nyx (goddess of the night). In modern Greek the word Haro (referencing Charon) is frequently in the same way the Grim Reaper or Death might be referenced in English. For example – "Htipise o Haros tin porta" means "Death was knocking on my door."